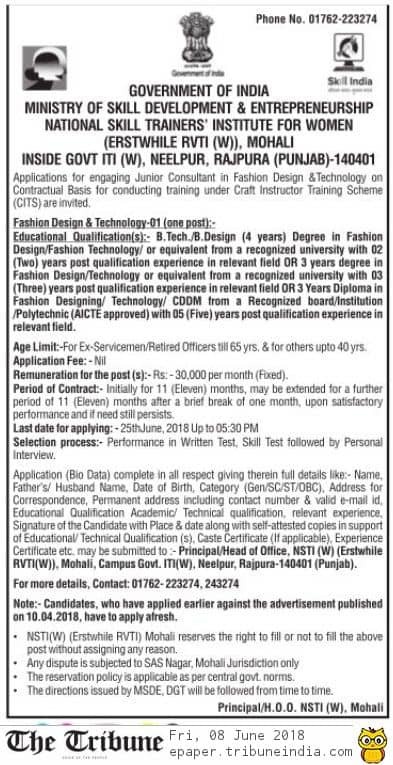 Ministry of Skill Development & Entrepreneurship (MSDE), National Skill Trainers Institute for Women has given a notification of 01 Junior Consultant in Fashion Designing and Technology Job on the contract basis in Government ITI Neelpur, Rajpura. The interested candidates can apply for the MSDE Recruitment 2018 on or before 25 June 2018. Ministry of Skill Development & Entrepreneurship Recruitment 2018-19 notification is out. 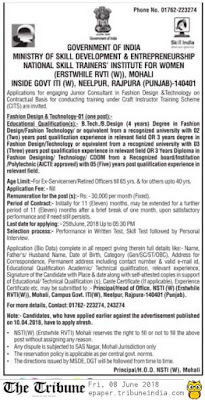 As per the Notification, there is 01 Junior Consultant in Fashion Designing and Technology Vacancy. The educational qualification is B.Tech/B. Design degree in fashion designing. The age limit is up to 40 years. If you are looking for Govt Jobs in MSDE Rajpura then this article is going to be very helpful for you. The candidates should have passed the B.Tech/ B. Designing (4-years) degree in Fashion Design/Fashion Technology or equivalent qualification from a recognized university. For more information, you may check the advertisement notification link given below. The age limit is 40-years and 65-years for Ex-Servicemen or Retired officer. Rs. 30000/- Per Month fixed. Performance in Written Test, Skill Test followed by personal interview. Application (Bio-Data) complete in all respect giving therein full details like (i.e. Name, Father’s Name/Husband’s Name, Date of Birth, Category, Address for correspondence, permanent address including contact number & valid e-mail ID, Educational Qualification Academic/Technical qualification, relevant experience, signature of the candidate with Place & Date along with the self-attested copies in support of educational/technical qualification, caste certificate, experience certificate may be submitted to the Principal/Head of Office, NSTI (W) Erstwhile RVTI (W), Mohali campus Govt. ITI (W), Neelpur, Rajpura-140401 (Punjab) on or before 25 June 2018 up to 05.30 PM. Last Date: 25 June 2018.